In 1846, three Irish brothers will leave their homes and emigrate to America. They will marry and have children. These children are the main characters in our books. There are over ten children of various ages in our series. This allows us to maintain the main character’s age as similar to the reader even though we are covering almost a 10 year period. 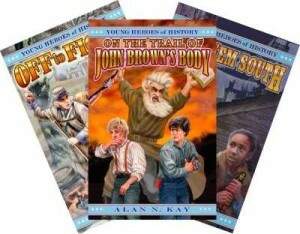 In the two pre-civil war books Send ‘Em South and On the Trail of John Brown’s Body, we see how the older boys are affected by slavery and the North-South antagonisms. First we have a story about slave-catchers and runaways and then we see how this leads to the abolitionist crusade of John Brown. By the time the Civil War has begun, the family has split in two just like the nation. This allows us to look at the war from both sides. In Books Three through Eight, we look at what it is like for a kid who joins the army in both the North and in the South, how civilians are affected, the role of blacks both slave and free, the medical practices and problems and of course the major battles such as Fredericksburg, Antietam, Gettysburg and Sherman’s march to the sea..
We end the series with a look at how the South has suffered and their attitudes in defeat. Books nine and ten deal with the assassination of Lincoln, the reconstruction period and the rise of the Ku Klux Klan.